USS Jacob Jones and USS PE-19 both pick up survivors from the Brazilian merchant Buarque 30 nautical miles south-west of Cape Henry in position 36º35'N, 75º20'W. 27 February 1942, USS Jacob Jones (Lt. Cdr. Hugh David Black) departed New York alone to patrol and search the area between Barnegate Light and Five Fathom Bank. She then received orders to concentrate her patrol activity in waters off Cape May and the Delaware Capes. In the afternoon, the destroyer spotted the burning wreckage of the American steam tanker R.P. Resor, which had been torpedoed by U-578 the same day. The destroyer circled the tanker for two hours, searching for survivors before resuming her southward course. 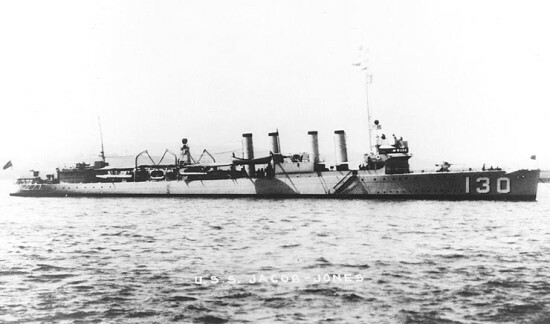 At 1057 hours, on 28 February, USS Jacob Jones was hit by two torpedoes fired by U-578, while proceeding completely blacked out at 15 knots. The first torpedo struck on the port side just aft of the bridge and ignited the ship´s magazine. The explosion completely destroyed the bridge, the chart room and the officer´s and petty officer´s quarters. As the ship stopped, the second torpedo struck on the port side about 40 feet forward of the fantail and carried away the after part of the ship above the keel plates and shafts and destroyed the after crew´s quarters. The ship remained afloat for 45 minutes, allowing about 30 survivors to abandon ship on four or five rafts. But as the ship sank in position 38º37'N, 74º32'W, the unsecured depth charges exploded, killing several survivors on a nearby raft. Some hours later, an US Army observation plane sighted the life rafts and reported their position to USS PE-56 on Inshore Patrol. The corvette was forced to abandon her search after three hours, due to strong winds and rising seas. She had picked up 12 survivors, but one of them died en route to Cape May. The search for survivors continued for two days, but was fruitless, and 138 crew were lost. At dawn, 28 Feb 1942, off New Jersey coast U-578 fired a spread of torpedoes, 2 or possibly 3 hitting the ship. The first one struck portside at the Bridge, causing an enormous explosion, it is believed the ships magazine exploded. The whole bow blew away, and the second torpedo then struck the stern, causing just as much destruction. However, the mid-section remained afloat for 45 minutes. Several depth charges exploded when going down with the ship, killing many survivors. A few hours later an Army observation plane spotted them, but when rescuers arrived, they found only 12 survivors, one of them died en route to the hospital. Sunk on 28 Feb 1942 by U-578 (Rehwinkel).